@Mandymom ...Huh. Never really gave that much thought. We do have the benefit of having a very intelligent brain, which allows us to rationalize. Also, we are by nature pack animals, so we in fact survived with kindness most likely due to pack animal nature; that if you were ostracized from the pack you would die alone. Thus, humans banded together. At least, that's my thoughts on that subject. That cute little bugger in my avatar is <UnNamed> from my Creatures 2 Wolfling Runs! Click here if you'd like to know more. Well, I guess teamwork has it's place in nature if it's to kill everything you cannot alone. Grendels aren't so bad, but I love Ettins! They're adorable! The complexity of creatures is quite amazing. Most animals don't try to fight to the death, the risk of serious injury is too high. They mostly just passively out-compete each other. Another glorious photoshop wallpaper of this series for ya face hole. 1920x1080 Resolution. @Dragoler @Mandymom Thank you for your imput, and I hope you enjoy this series! Oh my god, that wallpaper is so accurate. I think you're also one of the first people I've seen using the colored text feature regularly. I adore Creatures 2, but I do find it nigh unplayable without the improved races mods like Nova Subterra and Akamai Canny. It's just SO reliant on the hand's teaching ability that these creatures have very little survival instincts. @savannahs11 Well, this forum post is my little Wolfling mini-series. Gotta keep the readers entertained with cool wallpapers and neat colors! Alright, the Kannova Norn run is about to begin! These guys are Canny Nova Subterra Norns. They are a perfect mix of the two genomes, resulting in what is hopefully a superior master race Norn. IRRELEVANT REQUEST: If one of you could download the Kannova Norns found here,, can one of you knowledgable chaps possibly edit the female Norn in the starter kit and make her crimson red? Not like a bright red hue but a rusty, kinda rose colored red? Thank you so much! If you can't be bothered, don't. It isn't my birthday or anything. Moving on, I will be importing 10 Norns this time around, half of them male, half female, half blue, half brown. I'll report in again after the Norns are imported and start settling in! Color is one of the easiest things to alter. Just open the Genetics Kit, open the genome you want to edit, and find the Pigment and Pigment Swap genes. You're a lifesaver! Thank you. Pretty rusty Norns coming right up! I'm going to add them to the list of Norns in this run. The Kannova Norn run has begun! Thanks to Lurstaap's quick responses to my relentless onslaught of questions related to the Genetics Kit, I've made some of my Kannova Norns pretty and red! I've also given the ordinary base Norns from the Kannova pack the "Jungle Norn" template, so that there are 3 different "appearance" swaps as well as 3 different colors. 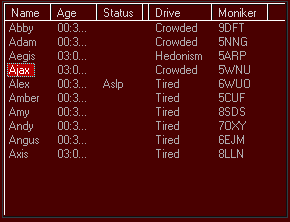 I've also gotten the Wolf Control "COB" (It's an .exe) that names my Norns by generation for me! It also autokills unconcious Norns and overall makes things even nicer. Doesn't really help the Norns, but it does help me. On a side note, as a result of me not knowing anything about the Genetics Kit, the male and female rusty norns look slightly different, with the females being slightly lighter. That means I can tell the genders apart! Cool side effect underlying my ignorance. I'll be back with an update soon! P.S. This has to be the best freaking emoticon on this website. Pirate Norns?! That should be a movie. The Wolf Control .exe tells me EVERYTHING about what my Norns are up to. Aegis reminds me of myself. Click this. Aegis has been taking some notes from Futurama. It's really cool to know the exact status of the Norns. I didn't even know they had a "seeking self pleasure" status. That's cool. Oh my god. The Meat Vines are the savior of Norns everywhere. I know, I know, I've already advertised this. But it works. The Meat Vine COB is the endorsed COB of TheDrunkenNorn's Wolfling Runs! And by endorsed, I mean that I like it alot. I will use it for every run. I passed 2 hours watching the Space Cop movie, and came back to the Kannova Norns on their third generation! Edit: They are now on their fourth generation. Very few early Norn deaths, to my immediate surprise. Usually within the first hour half of the Norns die of starvation. Now, they seem to be doing well. The rusty Norns are sooo adorable!!! I love the diverse colors of this population. Check these guys out. And it's time for the next song that goes well with Creatures gameplay! Also! The cutest freaking Norn ever was just born. A mix of the Golden Norns and the light tan rusty females. This is by far the cutest Norn population I've ever had. I'm really glad that I did this run. Click this. This is my favorite of the Norns in this run. Her name is Belle, and she is a gorgeous golden color. Color means a lot to me. I am so happy my little meaty abomination creation is serving you so well. Keep the updates coming! I love looking at all the images you post of your multicoloured norns. So GimmeCat, you like looking at the multicolored norns? How about all 6 distinct colors in a single picture? (Assuming that you call the two different blues and different browns different colors). Click this. Your Meat Vine COB really does help prolong the Norns' lifespan by quite a bit. They've gotten to the point that the main problem isn't hunger anymore. The next problem down is crowding due to the 40 Norns cheat (These populations get really big, and they start to brawl). As you can see by the picture, there are a LOT of Norns. My babies! Thank you so much for your feedback. I'm really glad you're still reading this. Now that I think about it, the last picture had just as many colored Norns. Oopsie. In terms of generations so far, we've been straddling the line between 4 and 5. Every time a Gen 5 Norn is born, it dies of something. I've been stuck at Gen 4 for a little while now. I have two Gen 5 Creatures, but I'm sure they won't last long. The letter E is cursed! (Naming Creatures by Alphabetical order by generation helps keep track of what generation Norn they are). 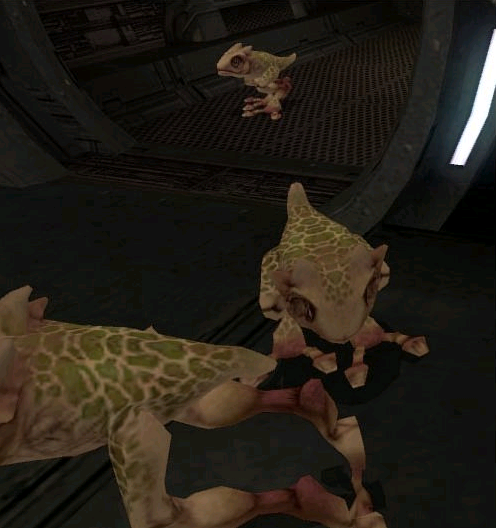 They breed like Gizka man. 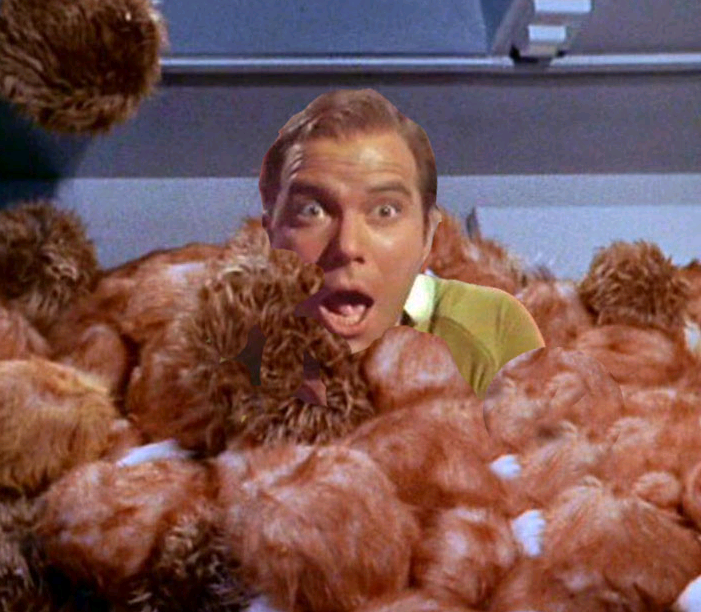 Any of you guys remember in Star Wars: Knights of the Old Republic how when you'd buy that pet animal on Manaan they'd wreck your ship and get all Tribble on everything? Had dozens of them. Just like this. This is me right now. Click this. Decided to go ahead and make this run's wallpaper about it. The wallpaper is in 1920x1080 Resolution. Also good news everyone! Some of the Norns are actually growing to Elderly age. That means that there are Norns in this Wolfling Series that actually lived full, enriching lives instead of dying young. This makes me giddy. Mutation in Creatures 2 is a beautiful thing. Click this. SO! The Wolf Control .exe doesn't work with the 40 Norns cheat. Meaning, it doesn't work at all, because EVERYONE uses the 40 Norns cheat. I don't think anyone is on a Windows 95 computer anymore. Actually, I wouldn't think many people use it. I think the general recommendation is to not have more than 20-25, isn't it? It's not about whether our computers can handle it, but whether the game engine itself can handle it. Every living norn puts a strain of multiple active scripts running constantly, every frame, that the engine has to update and calculate. For a game coded in the Win98 era and never intending to allow more than a small group of norns, its internal cache and memory pools are probably stupidly small. For a more modern comparison, take The Elder Scrolls: Skyrim. Even though it was coded well into the x64 era of computing, it still used x32 coding. That gave its memory handling systems a limit of 2GB of RAM usage, above which the game would simply crash to desktop if you were using too many high-res texture packs. Its script engine, Papyrus, was similarly limited in memory, and too many intensive mods with lots of running scripts would cause scripted game behaviours to lag, fail, and also crash. Same thing happens with the Creatures games, which is why it's much safer to keep the population small. The more norns you have, the swifter orphaned scripts pile up in the background of the world, on top of all the active scripts still attached to living creatures, which is what ultimately ends 90% of wolfling runs; the engine simply can't keep up with it all. 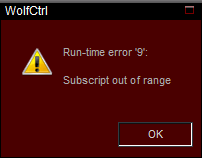 Edit: Btw, about the wolfctrl error. That error happens due to unhatched eggs, in my experience. For some reason, the program can't handle listing unborn babs. It may be sufficient to simply pause all existing eggs, but I'm not sure about that. It might require there to be absolutely no eggs in the world. There's another wolfling program you can try. Search for Wolfling Monitor. Yeah. Even in C3/DS I personally usually set my population limit at about 25-30. More than that is just too laggy for me. Hmm... I may have miscounted on the "42" count earlier, because every time I come back to the Wolflingers it seems to be consistently 40. Though, I usually count the list about 3 times before I post it here. Weird. This is true, but I've also not had any problems with the 40 Norns cheat except the .exe not working. Even the Akamai Canny Norn run that started this didn't go nearly as long as this one has so far, and that population was closer to 20-30 (Meat Vines). That's an interesting point, though. For now, I'm going to continue running the 40 Norns cheat because it is insanely cool to have a larger population. If there are huge problems that arise due to it other than third party .exe's crashing, I will address it. Otherwise, this Wolfling Run will continue using it for now. I do really appreciate your imput though. Back when I had Morrowind I got really modcrazy on one of my larger saves (This guy had saved the world and collected one of every item in the game. He used powerleveling methods to reach level 501, and all of his stats were maxxed). After about 200 mods, the game imploded every time I started. It got to the point that I had to take away some of the larger mods to even continue playing. I'm using the Live Birth COB. There are no unhatched eggs. ...Huh. Running 40 Norns constantly on C2 doesn't lag it in the slightest. For now, I will be replacing the current Wolfling .exe with the Wolfling Monitor. Hopefully it can name all of the UnNamed Norns by generation. Edit: The Wolfling Monitor is for Creatures 3. Edit Edit: Nevermind. Thank you all for your imput! Oh! Hey, does anyone actually know how to disable the 40 Norns cheat? Or... is that even possible? That's one big pile of Norns. Turns out I'm not totally helpless! Found a German cheat injector that should set it back to 16 Norns 20 Norns. I'm going to at least have 4 more than the base game. I do agree with one thing though, base Albia is much too small for 40 Norns. They're crowding up everywhere, all the time. Some have trouble sleeping because there are too many Norns around. As well, the 40 Norns cheat is kind of easy mode, for one reason: Fast breeding. With 16 Norns, the health of individual Norns becomes much more of a concern. When you have 40, it is almost guaranteed they are going to breed faster than they die, creating a perfect culture that can survive no matter what. I've noticed this with the Akamai Canny and Kannova Norns in particular, they're much too good at survival at 40 Norns. Addendum: The only real reason I want the population cap back to normal is because my Wolfling Control .exe doesn't work with this many Norns. Well, there isn't much of a challenge at this point. With the realization that these Norns haven't gone under 40 Norns in the past 10 hours, they've essentially beaten it as well. And I think I notice why! Here is my theory: The population cap was 40, right? Well, any pregnant Norn seemed to have their pregnancy delayed until after another Norn died. But there would always BE a pregnant Norn waiting for the moment that one died, therefore pretty much maintaining a perpetual society. I'm going to do something special for this run. I'm putting the newest born Norn (Of a 26 hour Wolfling Run, of at least Generation 6) up for adoption on the CreatureCaves. Here is a picture of her. She is named Almalexia because of her yellowish tint, similar to a certain character from The Elder Scrolls III: Morrowind. You can find Almalexia's link down below. Please tell me if you download her (Preferably in a reply on this general forum post) and how she does! Game Year: 003, or 4, depending on whether you go by the Status Bar or the Calendar on the Yggdrasil Tree island. Join TheDrunkenNorn's Wolfling Runs next time, where we go to a watery place. So, you end your runs when... what's the condition, exactly? I'm not sure I understand why they end so early. Hah, Oh crap! Thank you GimmeCat. You're the best. I love how helpful the Creatures community is. I wonder if anyone would mind if I mosey'd on down to the COBS section and threw this bad boy in with them. Other players would probably like to have this at an easy-to-find site (Typically, as a new player, I find it a bit daunting finding the COBS and .exe files that I need at places other than here). If this application can name Norns that are already in the game by Generation, I may be able to figure out Almalexia's current gen for the download. My first upload . 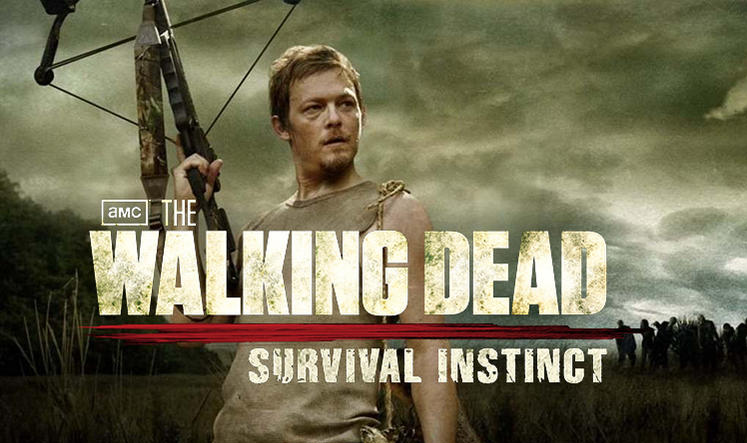 I'm so excited about this game. Question: I don't see an autonamer feature on this one. How does that work? I'm mostly ending the last one because I can't tell what generation they are anymore now that the Wolf Control exe is not working anymore. I have no basis from which to tell how far they've come other than how many die. It's basically just watching Norns have no struggle whatsoever to survive, perpetually. That is the reason why I'd like to get this newest one to work, and/or why I'm making a new one without the 40 Norns cheat. My ultimate goal is to reach Generation Z with a Norn population, but I need to know when that is. Generally, I end a run about when I figure it will get boring for both myself and the readers, or when the population loses. I'm sure raving on about how well they are doing is fine and all for you guys, but I have no stats to base it on, no way to tell how far they've come. I also don't know enough about the game's genetics to tell any of you about how they are doing genetically, what mutations have occurred, what have you. I would like to continue the Kannova run, but I see little point if I cannot tell how far they've come, considering there is no change in their pace (They always stagnate at 40 Norns, and never fluctuate from that). The autonamer feature on the first Wolf Control application I had was an awesome increase in how interesting these runs are, and the primary reason I'd like to move on from it is because that feature no longer works, resulting in the stagnation I referenced earlier. Essentially, I screwed up, and I want to fix it. If there is a better way to fix this problem, then the Kannova run will be sustained. I have a lot of heart and soul in these Norns in particular; I really love this population. I can't help with the autonaming, sadly. That's the one feature I loved about wolfctrl too. With my runs, I would name all currently living norns, and then occasionally check back with the game every hour or so, naming the new arrivals based on the parentage named in their Owners Kit. If multiple new generations had appeared, I would name them in order from Oldest to Youngest, so that the Owner's Kit would always contain the parents' names of the newest gens. So for example, if I found an <Unnamed> whose parents were A1 and B2, I'd name her C1. In this way, it's not imperative to be constantly keeping watch over the game. It can just be dealt with as a periodical administrative procedure. As for genetic analysis, use the D-DNA Analyzer. Open the .GEN of the target creature (in your save directory's Genetics folder) and do "Mutation from parents". You might also want to compare the creature to a Gen-1 starting point, in which case I would make a note of one of your starter norn's monikers and later use the "Compare with" feature instead. Again with the lifesaving. Thank you. I'm so going to make a gene analysis section of the newest Norn to the first Norn now each run. Good stuff. 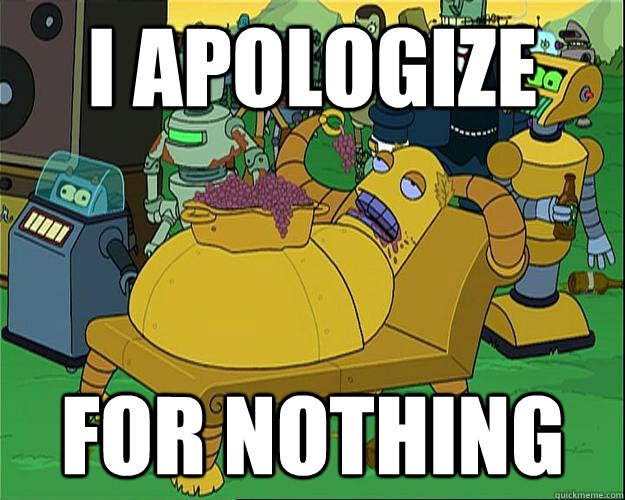 As for everything else, I'm starting anew and on not easy mode. From now on, my Wolfling Runs will be much longer unless Norns start dying off. Alrighty folks, we're putting our Norns underwater! I have no idea what actual genome these fellas are, but the Amphibious Mernorns are the newest Norns to be introduced into the Wolfling onslaught! As I have no actual idea what genome these guys use, I assume they use one optimized for the water. Whatever the case may be, we're going to be having some fun under the sea. For those of you hyped for Mad-Max style survival because of the Waterworld trailer I posted as the teaser, have no fear: the next Wolfling Survival will be barren, lifeless, and cruel (And hopefully less of a let down than "Hell on Albia" ). I'm going to be hatching 10 Norns: 5 Males, 5 Females. Because the base Albia is not suited for waterbourne creatures, I'm going to be using the Albian Sea Bay world. This world is entirely underwater, and while it looks absolutely terrible and low-res, it gets the job done, and I recommend it for anyone wishing to hatch an Atlantean Norn culture. The next update will be after the Norns begin to get settled into their new home. The Norn cap is now 20, meaning that the Wolfling Control application should now work, and the runs will be more difficult. Update: I freaking love it. I don't need to use the Blueberry4$ cheat to move my Norns! YES! You cannot know how much happiness I feel right now. I can finally move them away from the hatchery so they don't clump together and die of starvation. Update: There are a lot of nice underwater shelves to put the absolutely amphibious Meat Vines on. As well, there is a ground floor that I -really- want to put Frog Norns into. I'm going to check up on the genome of the Mernorns. Mernorns are SO COOL. Click this. They can't swim until they are adults, but with a COB included adults can swim around the level like the flying Norns. They look adorable. Definitely one of the cuter Norn species out there, even if they use mostly base sprites. The Wolf Control Application works again, so lets see if we can't make Atlantis. Nevermind. Frog Norn sprites come with the package. Color me really impressed, this breed has a lot of effort put into it. Kudos. Click this. Here is a picture showing off the majority of the population. Their sprite mixture at birth is awe-inspiring. I am simultaneously impressed and annoyed at the quality of this map. It is expansive and perfect for seafaring folk, but it looks sooooooo low resolution that it is almost an eyesore at times. I will get used to it, and it is a great world overall. I'm really excited about this run. Click this. I broke the rules a bit. Click this. One of the Mernorn males just DIED out of nowhere . I'm hatching another male in. In Generation 1, a single death is devastating. Forgive me please. Update: Maybe I don't feel so guilty. The newly hatched Mernorn is GORGEOUS. Click this. Meanwhile, other Norns are not photogenic in the slightest. Geez. Click this.